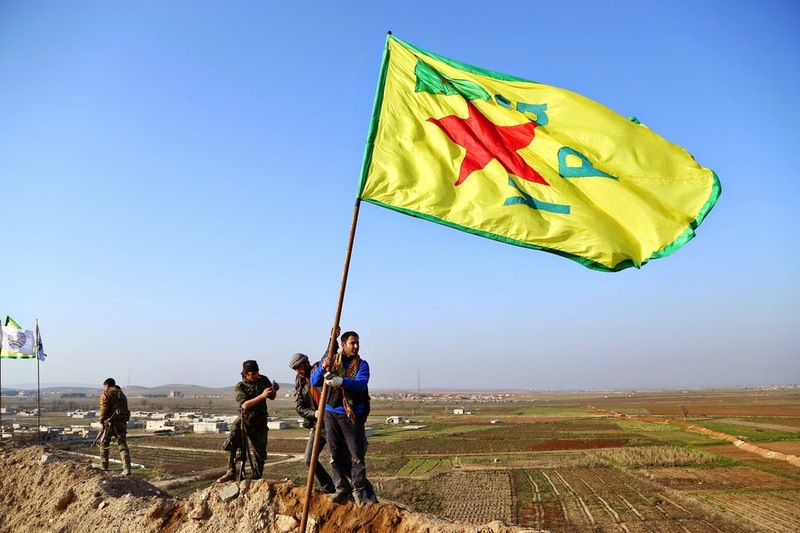 The Kurds and Americans have successfully pushed ISIS out of Kobani. We can all take a minute and breathe a quick sigh of relief. Then let's talk quickly about what happened, why it matters, and what's next. Before we go on, a huge shout-out to the venerable Haghal Jagul for absolutely brilliant and tireless work in keeping these excellent maps updated with rich detail in the Wikipedia Commons. 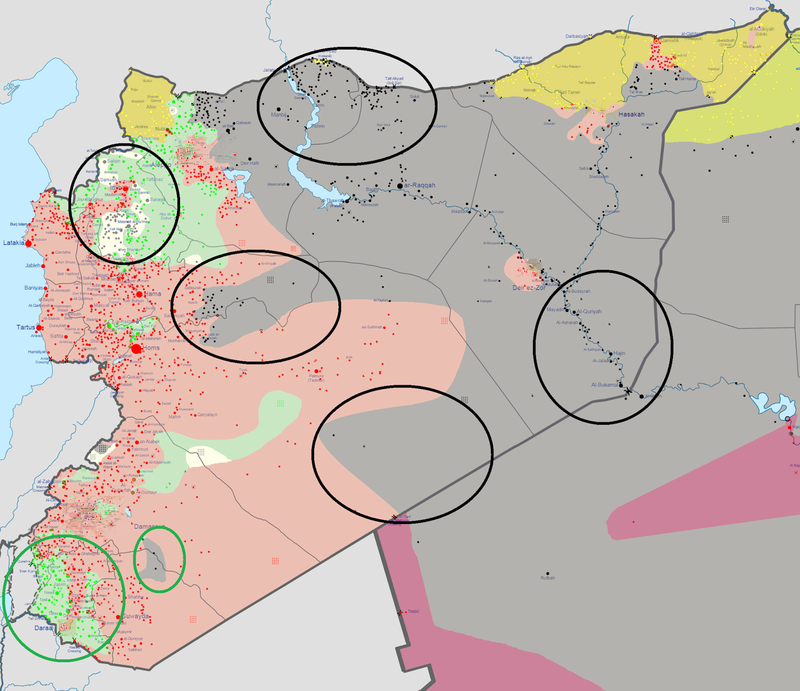 4 months ago, after grinding itself against the Kurds and making modest-at-best progress, ISIS decided to turn its attention towards closing off its northern front, eliminating a Kurdish force of about 2,000 in Kobani, and securing supply lines for a Western advance towards Aleppo (note the giant lake--the roads go north). Armed with about 40 tanks (against 0 for the Kurds) and somewhere on the order of 5,000 fighters, ISIS hoped to knock this fight off pretty quickly, and in the span of about a month almost did so. The "siege," which was less about starving the Kurds out and more about pounding them into submission with artillery, was followed by a final push on Kobani that almost captured the city until US-led airstrikes started in earnest (as well as US airdrops of supplies and armaments). The airstrikes hit ISIS positions a few times per day and the Kurds slowly gained ground. The details of the fighting are, as usual, pretty detailed in Wikipedia. But in short, through some effective coordination (Rear Admiral John Kirby, the Pentagon press secretary, said: "I think the air strikes helped a lot. It helped when we had ... a reliable partner on the ground in there who could help us fine-tune those strikes. "), the US used airstrikes to lift the pressure from ISIS shelling (the tanks couldn't be out in the open) and prep the ground for Kurdish advances through the city by pinning or just totally blasting ISIS positions. Of the 1200-1500 ISIS killed in the fighting, airstrikes may have delivered about 600 of those. Kurdish reinforcements from Iraq also crossed through Turkey to bolster the defenses, which were (now famously) made up largely by untrained civilians including young women (rumor has it that ISIS militants believe they won't go to heaven if killed by a woman). Once driven out of the city, the now-exposed ISIS fighters started moving back to cover in nearby villages. Apparently Kurdish fighters have taken back a few of those (though dozens remain in ISIS control). Personally, I don't think there's going to be a rapid expansion of Kurdish territory, but if US airstrikes can keep up, strategically-located villages can get picked back up until ISIS supply lines are eventually cut. The other, often-forgotten outcome, is that Kobani is mostly destroyed. US Retired General John Allen (anti-ISIS coalition coordinator) said that ISIS "has, in so many ways, impaled itself on Kobani." Political support for more airstrikes will remain high: they were very clearly the turning point in helping a beleaguered and vastly outnumbered & outgunned Kurdish force hold the town and repel ISIS. Its effectiveness means the administration will be bullish about employing it more, probably looking pretty fiercely towards the coming Iraqi offensive. This is going to be a significant shift--in October, nobody was shy about saying that the airstrikes were a total strategic failure. Generally, the casualty numbers by ISIS far outstrip those of the Kurds when they go head-to-head (the Kurds claim the headcount is about 7,000 to 1,000, but this is likely inflated), which means that ISIS is getting "ground down" in its fighting with the Kurds. It's a "symbolic" defeat for a force that is superstitious and driven by religious fervor. Recent recruiting has been successful due in part to a sense of inevitability and irresistibly. It will be harder to recruit if ISIS starts looking like a loser. Why did Kobani matter so much, in all the fronts against ISIS? It's a tiny town and a bit out of the way. Part of it was the size of the ISIS commitment: 5,000 fighters and 40 tanks is a huge force. The US wanted to defeat it to show that it could be done, even when outnumbered. Part of this is probably a lesson to the Iraqis for the upcoming counter-offensive in the north. Part of it is simply that the Kurds are some of the best hope to be had in defeating ISIS, and this was the first major victory that ISIS almost had over them. The US is willing to put a lot of resources into these guys because they have shown the skill and will to win, where Iraqi forces have buckled easily (the Kurds have retaken and are holding critical non-Kurd territory like Kirkuk--a political problem for another day) and Syrian forces are too busy fighting each other to be dedicated. Once the US put its chips on defending Kobani, it had to "double-down" to win when it was losing, or else the political will to support the Kurds with airstrikes would have totally evaporated. I suspect the significant media attention to Kobani was fairly strongly encouraged by YPG and US political outlets in order to raise the symbolic importance of victory. Now the US has it. Over the past year, ISIS has generally advanced significantly in Syria and been slowly pushed back in Iraq; the progress here has generally given me hope for Iraq and pretty dark pessimism for Syria. 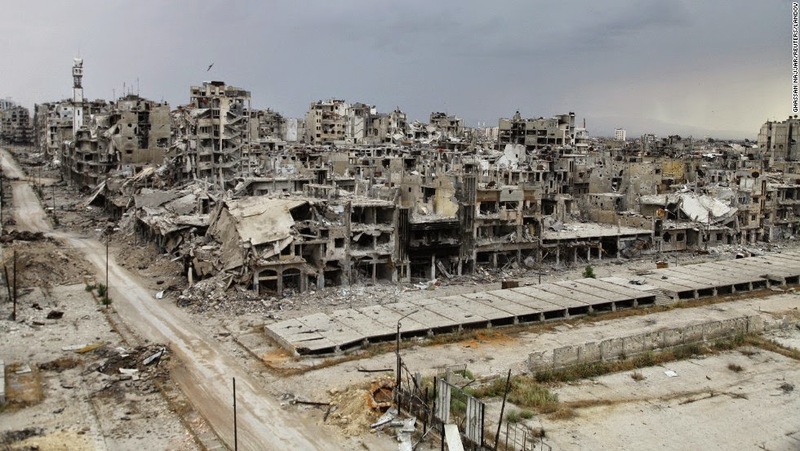 In August 2014, things were already pretty ugly in Syria. 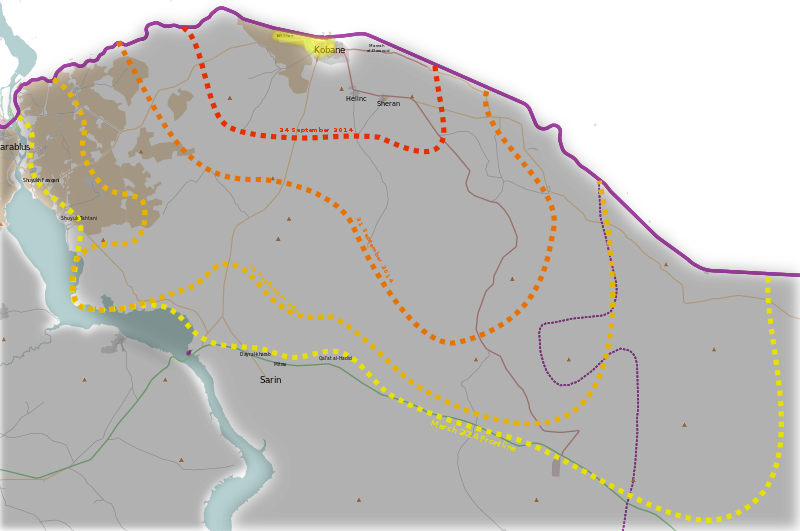 ISIS had ar-Raqqah, had cut off the northern Kurds, and held much of the oil-rich east. 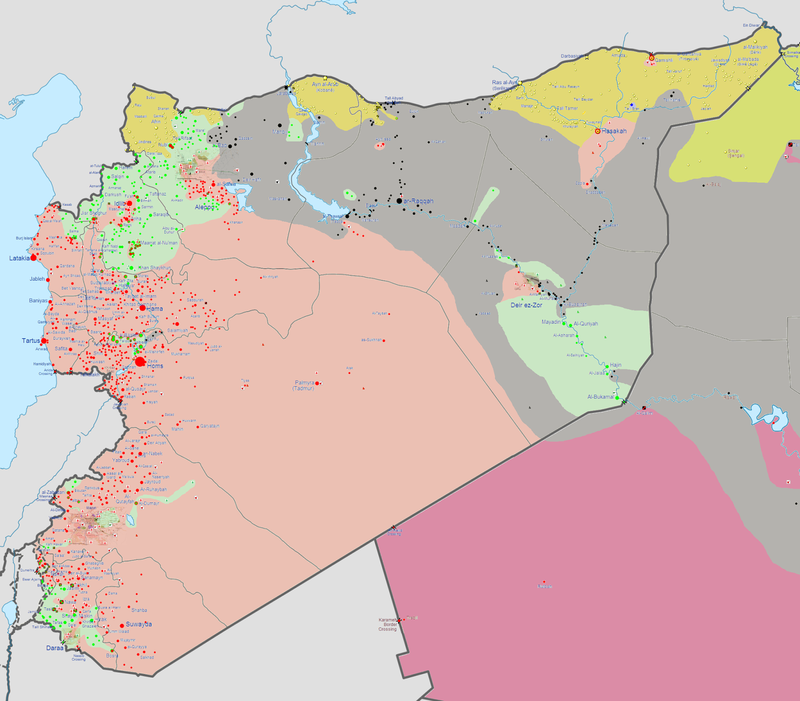 By January 2015, ISIS has consolidated its holdings in the east, nearly annihilated the Kurds in the north, pushed far towards Homs/Hama, and even popped up down south. Those guys in white in the northwest are also Islamists. Again: the government and rebel forces are so busy fighting each other that ISIS is able to play to where each of them is weak. It's really, truly bad news. There is a little glimmer of hope. See the green circle in the lower-left? That's a slow-but-steady amount of progress by the southern rebels, pushing towards Damascus. They're getting most of the outside help and are seen as the most likely part of the rebellion to succeed. Taking Damascus would be incredibly difficult and wouldn't end the war, but it if happened and Assad was ousted, a Sunni-Alawite peace could probably be forged. In August 2014, things were looking really ugly in Iraq. The lightning-offensive had just occurred and ISIS forces were pushing into Western Baghdad... and working on just plain surrounding it. 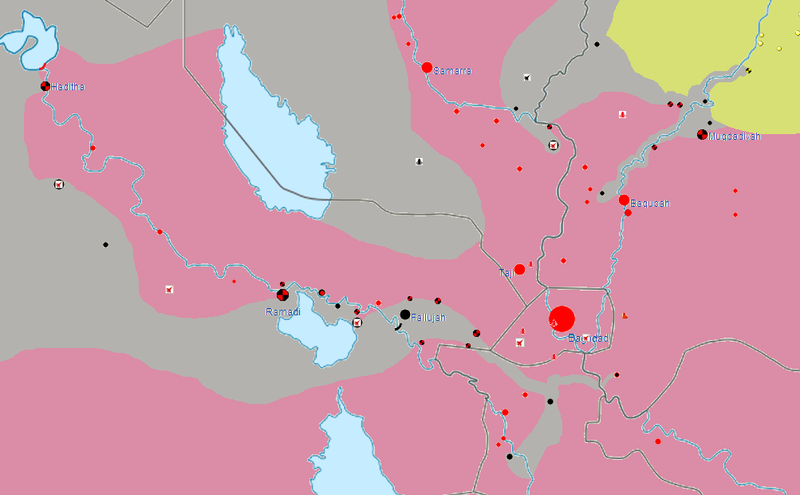 They'd also managed to push into some Kurdish territory (much of it not pictured). Despite the general weakness of the Iraqi army, they're well-armed and have significant US support. In the past few months, they've pushed back the most existentially-threatening parts of the ISIS advance and taken back a few of the lost cities. The Kurdish front seems secure and the idea that Baghdad might fall has passed. Fallujah is going to be this big grey spot for a very long time--even after Mosul falls (if it does). But slow, conservative progress is being made to establish a secure front around Iraq and hopefully surround (and then besiege) Fallujah, which would set the Iraqis up to focus on pushing north. Not pretty, but it gives me optimism. Kobani might come to be seen as a mini-Benghazi. 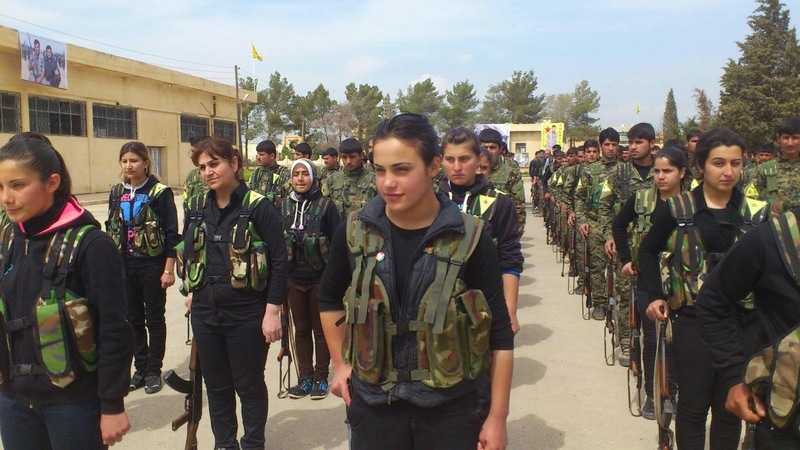 Kobani now has a lot of seasoned, well-supplied, and pissed off fighters without much of a home left. They're in effective coordination with the US and they're ready to push out. Immediately: if I had to guess, the US and Kurds will want to push out to take the two nearby border crossings (Jarabulus and Tall Abyad), both to "secure the area" generally and to bring Kurdish fighters, civilians, and supplies back to this area to support a further offensive. Expect action towards these areas soon. Recapture Manbij and the Tishrin bridge to totally cut off western ISIS forces. 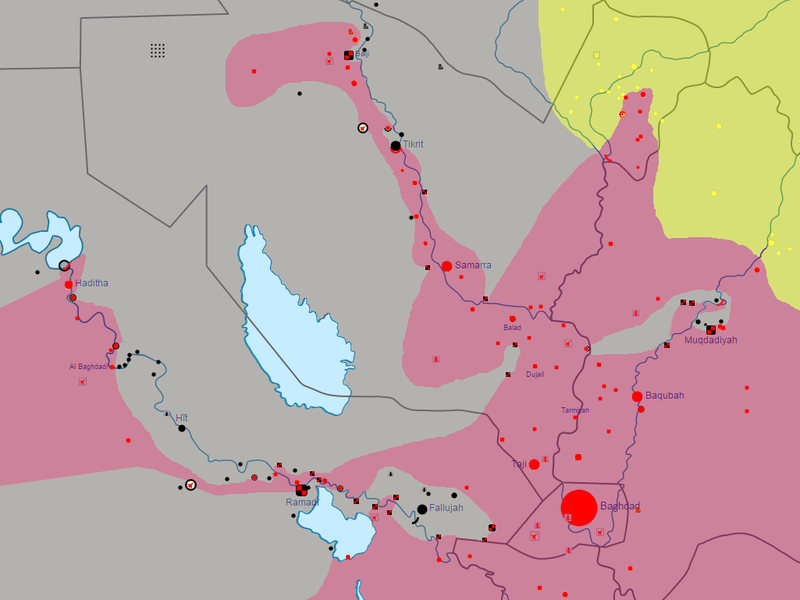 Eventually the Kurds may try to link back up with more secure Kurdish forces in the northwest. It's going to be slow-going and I still see absolutely no hope for Syria beating ISIS in any serious way until the government-rebel civil war ends somehow. Iraq, on the other hand, should see a lot of relief here if ar-Raqqah is under pressure from the Kurds, which will make the probably-spring counter-offensive a lot easier. Just keep in mind that a defeat in Kobani for ISIS is even worse than it would have been for the US, which means a second offensive is possible. The good news is that if tanks come back into the picture, the US is better-equipped to hit them as they move through the desert (again, much like as Libyan tanks approached Benghazi). Speaking of Libya: did you know Libya has been in full-scale civil war for the last 8 months? We'll get to that one soon.